UTrailing - universal trailing stop. The Expert Advisor is useful for any trader, especially for those trading manually. The EA has a trailing of pending orders and six main modes for open orders: by points, bar extreme values, fractals, volumes, indicators (Parabolic SAR and Moving Average). Works on accounts with 4 and 5-digit quotes. Magic Number (-1 for all, 0 only manual) - magic number. 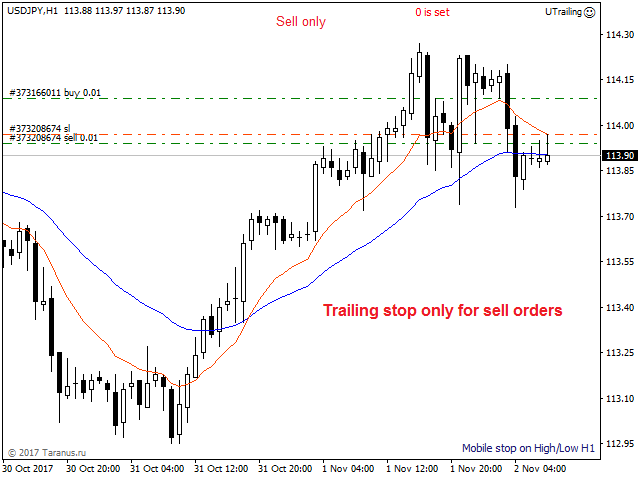 Set -1 to trail all orders, set 0 to trail only orders opened manually. All Symbols - allow trailing stop on all symbols immediately. 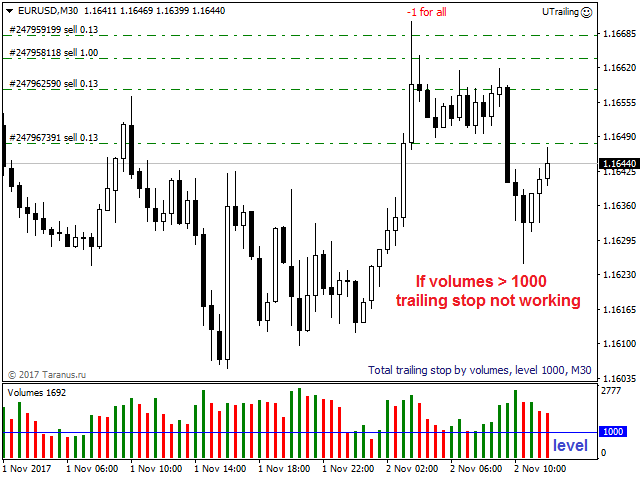 Trailing Stop open positions - enable trailing stop. Breakeven - enable the breakeven function. Pending orders trailing - enable trailing pending orders. Add Stop Loss - add stop loss. Stop Loss - set a stop loss. Profit/Loss percent - close orders by profit/loss percentage. 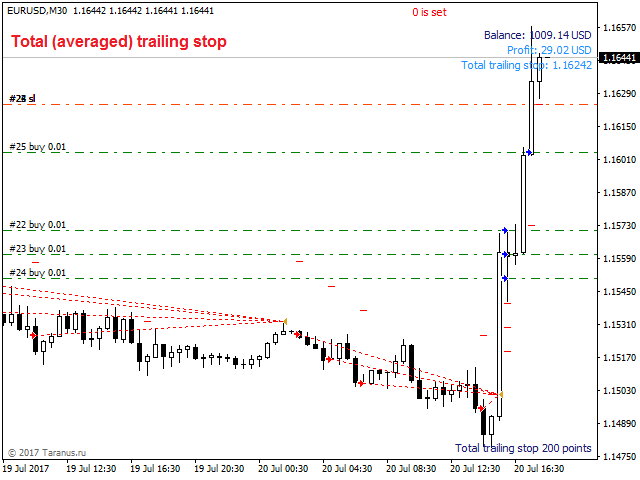 Total trailing stop - total (averaged) trailing stop. Virtual trailing stop - enable virtual (invisible) trailing stop. 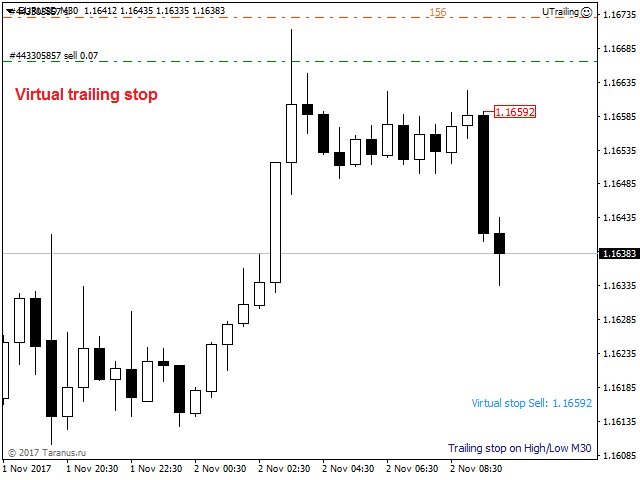 Timeframe for trailing stop - select a timeframe a trailing stop is to work on. Trailing step - trailing stop step. Indent from High/Low and fractals. MA method - МА averaging method. Applied price - applied price for МА. 1_Reduction in the lot on - first percentage for reducing the first lot volume. 1_Take Profit, points - first distance after the price, upon reaching which a position is closed partially for the first time and a lot volume is decreased by a fixed percentage. 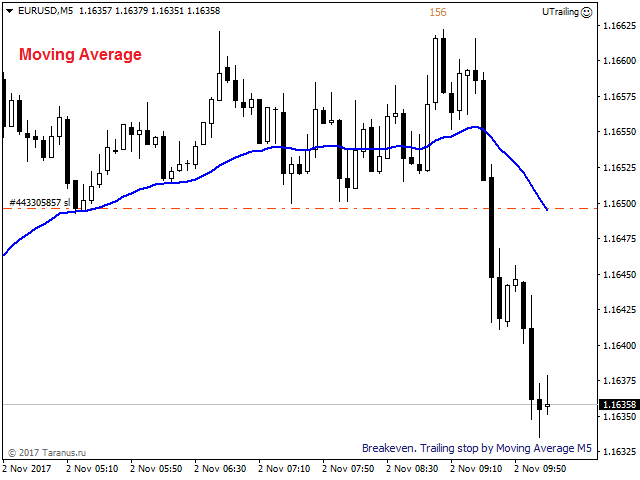 1_Level breakeven, points - first trailing stop level before the first partial closing. 2_Reduction in the lot on - second percentage for reducing a lot volume. 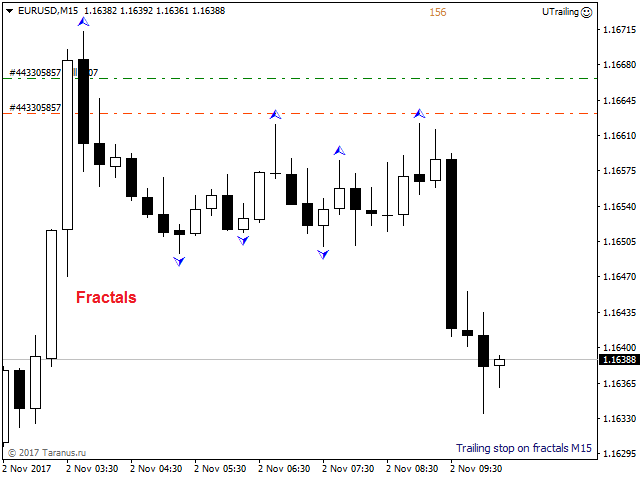 2_Take Profit, points - second distance after the price, upon reaching which a position is closed partially for the second time and a lot volume is decreased by a fixed percentage. 2_Level breakeven, points - second trailing stop level before the second partial closing. 3_Reduction in the lot on - third percentage for reducing a lot volume. 3_Take Profit, points - third distance after the price, upon reaching which a position is closed partially for the third time and a lot volume is decreased by a fixed percentage. 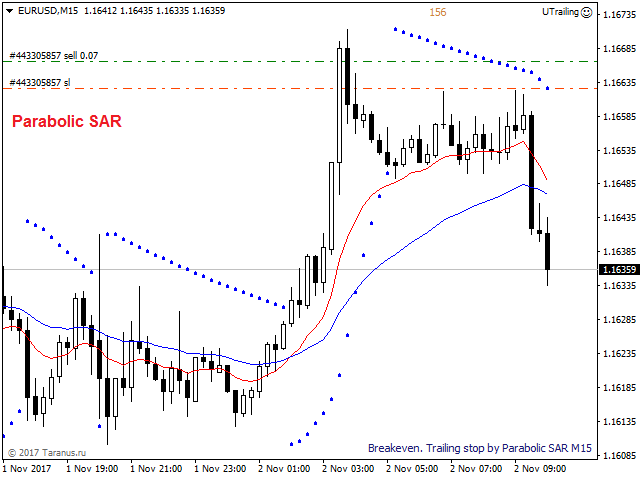 3_Level breakeven, points - third trailing stop level before the third partial closing. Block 4. CLOSE OFF LOCK - close lock. Block 6. SIMULATOR TRADE - trading simulator. A complete guide UTrailing EA guide is available in the Discussion section. Fixed errors in trading pending orders. Changes have been made to the operation of "hot buttons" now they can be configured only to work with one symbol or with all the symbols, removed the settings for the magic number and direction. 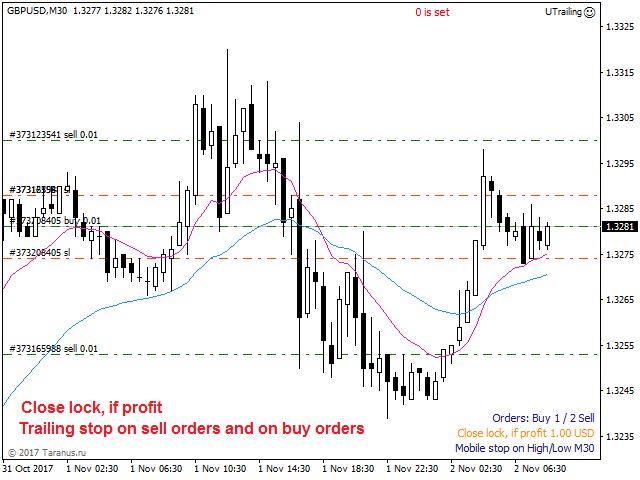 Added take profit for pending orders. 1. Добавлена возможность для счетов с 5-значной котировкой изменять уровень трейлинг стопа и безубытка дробными числам. Например: если установить уровень трейлинга 1.6 пункта, то для 5-значных счетов это будет 16 пунктов, а если шаг установить 0.5, то это будет 5 пунктов. Для 4-значных счётов по прежнему будут работать только целые числа. 2. Добавили команду "Close at profit" и размер профита "Profit in the deposit currency", если включить эту команду, то при появление прибыли больше "Profit in the deposit currency" советник закроет все открытые ордера и удалит все отложенные. 3. Команда включения трейлинга для открытых позиций перенесена в блок 3, в раздел "Mode selection:". 4. Команда включения трейлинга для отложенных ордеров перенесена в блок "2. TRAILING PENDING ORDERS". 5. Внесены изменения в информационные сообщения на графике. In the new version, features for trailing pending orders have been expanded. Now the trailing can be selectively adjusted by the type of pending order and the direction, which does not depend on the choice of the General direction. Pending orders can now be moved not only by points, but also by fractals and bar extremes. 1. Optimized the control menu of the Expert Advisor: the commands that are used more often moved up, and the commands that are used less often moved down. - setting to delete graphical objects. Added the function "Multiplier for cryptocurrency" allowing you to quickly change settings depending on the specification of cryptocurrency. Added Block 5 "SIMULATOR TRADE" - you can change settings for the run in the strategy tester. Fixed a bug in the "Total (averaged) stop".